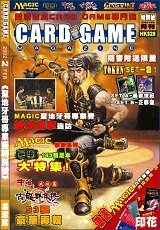 The Card Game Magazine debuted in February 2002 in Hong Kong. 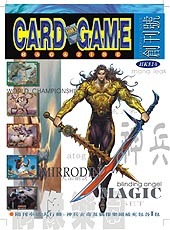 As hinted by its title, the magazine focuses on trading card games and related topics. Additional content of the special debut issue are four Traditional Chinese token cards which were inserted in groups of two. One group consists of two different Angel Tokens, the other one of a Beast Token and an Elephant Token. A second set of token was produced in 2003. 30 complete sets were awarded in a lucky draw contest held in issue #1, the first regular issue of the magazine which appeared in April 2003, over a year after the debut issue had been published. Participants had to send in a coupon, added in the magazine, and the winners were sent the tokens via mail. Further token sets were scheduled to be added as inserts in a future issue of the magazine, but this plan was never practised, as the magazine line was discontinued after issue #1. The already printed token cards were sold to card shops in Hong Kong. The three token cards are double-sided, one side featuring a foil layer.